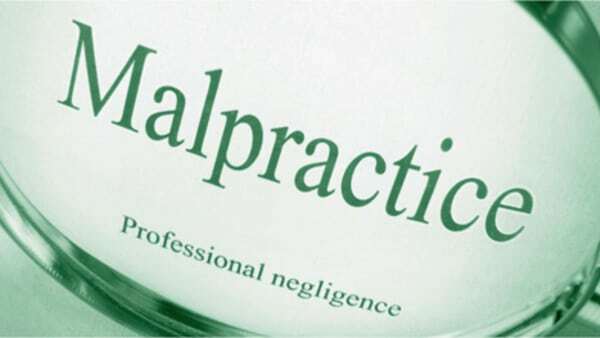 Wikipedia defines malpractice generally as: an instance of negligence or incompetence on the part of a professional. Malpractice includes negligence or misconduct on the part of a professional individual be that a doctor, a lawyer, a dentist or similar. Malpractice is reached when the failure to meet a standard of care or standard of conduct results in client injury or damage is caused to the client due to the error. Malpractice can happen in the medical profession, in particular with surgeons or other specialist practitioners who perform in areas often perceived to be high risk. Other areas where professional malpractice can be seen is in legal, financial and even real estate. In terms of the legal elements involved, a typical professional malpractice lawsuit will incorporate an allegation involving the Tort of negligence by the professional in question. Negligence specifically is conduct that is said to fall below the legally established or recognized standard for the protection of others against reasonable risk of harm. To be specific, under negligence law a person must violate a reasonable standard of care. “Many victims of serious medical errors cannot work, or they have huge expenses for ongoing rehabilitation and medical care. Against such overwhelming financial odds, Canadian victims of medical malpractice face huge challenges to obtain just and fair compensation for their injuries,” writes Halifax lawyer, John McKiggan. At Mullowney’s Law in Ottawa, we have experience in dealing with professional malpractice lawsuits. We will deal with your malpractice case professionally and efficiently and in great confidence. For more information, check out our 60 second video on this subject. I have read & agree to the disclaimer below. Disclaimer: The use of this form for communication with Mullowney's Law does not establish a lawyer-client relationship. Time-sensitive or confidential information should not be sent via this form. Doctors, nurses, and dentists have a professional and moral duty to act in your best interest with the utmost care. Negligent or reckless actions with violate this oath can lead to serious injury or even death. If you believe you have a medical malpractice claim, you should take the following steps: contact a malpractice lawyer, document everything, collect records, give notice of intent, and act fast because the statute of limitations is relatively short in this area. Medical malpractice cases usually revolve around two main issues. The first is negligence – when a healthcare professional fails to provide a reasonable standard of care to a patient and causes harm as a result. The second is a failure to get a patient’s informed consent for a medical procedure or treatment. Learn more about these two types of medical malpractice and how to pursue a medical malpractice claim in this article. We are an Ottawa law firm employing Civil Litigation lawyers focused on personal injury law, contract disputes, estate litigation, malpractice, and undisclosed (latent) defects in resale homes. Click on a practice area below for more information.